Being able to put a name to a face is important at large events. Professionally engraved name badges make your event or work place look well-organized and professionally run. If you’re in a hurry we can use our variable data printing technology which will transform your excel spreadsheet data into beautiful, professionally printed name tags. 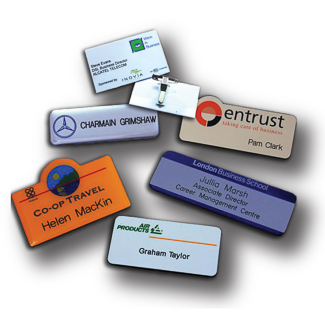 Given the nature of large events there's a good chance you're going to need your name badges or tags printed quickly. write or say about yourself.